We love our turkey dinners, especially toward the end of the year, but we’ve all suffered from dry, tasteless white meat that must be smothered in gravy to be palatable. Industrial facilities address this issue by injecting a broth solution into the breast and claiming that their product stays juicier than competitors’ turkeys. But that broth adds weight and affects the final sale price of the bird. It can also contain ingredients which may not be safe for people with specific allergies. Preparing organic heritage turkeys for Thanksgiving means the juiciness is mostly determined by whomever cooks them. 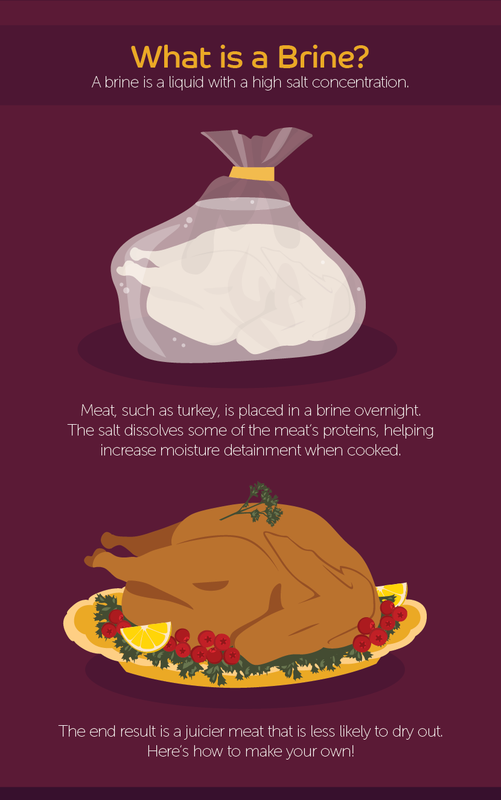 A simple turkey brine produces a bird that cooks up moist and juicy instead of leathery. “Denaturing” is when proteins in raw meat fibers unwind then join together, causing moisture loss. This occurs most often because of heat but acids, salts, and air can also cause it. Most meat loses 30% of its weight during cooking, because of denaturing. Soaking the meat in a salt-and-water solution can reduce moisture loss to 15%. Brines increase moisture three ways. First of all, the meat absorbs additional water so it’s 6% to 8% heavier at the start of cooking. More moisture at the beginning means more leftover when some is lost. It also dissolves some of the proteins in the muscle fibers, making the meat tender instead of tough. Most importantly, the salt denatures the proteins, causing them to unwind and swell with the water. The proteins then bond together while cooking, trapping the water. As long as the meat isn’t overcooked, causing the fibers to constrict and squeeze the water back out, the moisture will remain. You can brine more than just turkeys. Any meat which does not rely on fat for flavor and moisture would benefit from a good soak in salty water. Poultry, rabbit, lean pork, and shrimp are the best examples. Do not brine any meat that has already been brined or salted, such as “extra-tender” pork, because overdoing the salt can cause excess denaturing. Your meat will be even drier. Start with a basic salt-to-water mix. Shrimp and fish can have a higher salt concentration because it only sits in the brine for a few minutes while a turkey needs up to a full day and so should have a lower ratio of salt. For shrimp, combine a half cup of kosher salt to a pint of cold water. Mix until all salt is dissolved then soak fish fillets for ten minutes and large shell-on shrimp for up to a half hour. Poultry requires a 1:8 ratio of kosher salt to water. One cup of salt to two quarts of water. Cornish hens only need an hour of brining time while chicken pieces need two hours. A whole chicken should brine for up to four hours and a whole turkey for twelve to twenty-four. Don’t exceed too far past suggested times or the meat will start to dry out and taste salty. Also, if you’re using table salt instead of loose, flaky kosher salt, cut the amount in half because granulated table salt is much denser. Though many chefs add spices or sugar to their brines, these are not necessary for the juiciness of the meat. That’s the salt’s job. The added ingredients increase flavor and make the dish unique. Choose a non-reactive container, such as glass or plastic. It should be large enough that the meat is fully submerged. A zippered plastic bag works well because it holds the simple turkey brine liquid against the meat and you need less to ensure it contacts all surfaces. Either rub the correct amount of salt directly onto the meat or mix the solution beforehand. Add any spices or juices you wish. Keep the meat in the refrigerator as it soaks for the required time. Toss out the brine afterward. Always rinse the meat before cooking to remove any surface salt. Failing to do this can result in over-salted food. Don’t worry about rinsing away any of the brining benefits because those exist inside the meat instead of on the surface. Also, remember that your meat may still be a little salty after cooking, especially if you soaked a little too long or used too much salt. Reduce the amount of salt in your gravy or any other recipe which uses the meat, adding later after you see how the meat will taste. Whether they’re professional chefs or at-home cooks, many people boast their own tried-and-true simple turkey brine recipes. Experiment with flavors to find the one that works best for you. Remember to double or triple the recipe if you’re cooking an exceptionally large bird. Homesteader and professional artist Hannah Rose Miller loves how brining enhances her poultry and pork. She uses garlic, peppercorns, and herbs, and she especially loves how rosemary plant enhances a brine. Hannah uses hot water to dissolve the ingredients but stresses that the simple turkey brine should always be cooled back down before the bird is added. Poultry should always be kept cold until cooking time to reduce bacterial risk. Hannah brines for twenty-four hours. Even if she uses a frozen bird, she completes the entire process in the refrigerator. The last time Hannah brined a chicken for a friend, she received texts for a week: So moist!!! She says brining really does make a huge difference. For a chicken or cut-up turkey, combine 2/3 cup bourbon, ¼ cup packed brown sugar, ¼ cup table salt or ½ cup loose kosher salt, four cups water, and eight black peppercorns. Double or triple the recipe for a larger bird. Use a one-gallon zippered freezer bag for a chicken and a roasting bag within a sturdy container for a larger bird. Squeeze out any air so the liquid touches all meat surfaces. Seal the bag and store in the refrigerator for up to 24 hours. Choose your spirits: lighter beer for a milder flavor and the darkest brew you can find for a deeper, nuttier flavor. For a large turkey, use up to a six-pack. Replace a small amount of the water with the beer or simply pour the beer into a prepared salt-and-water solution. Add additional spices such as orange juice and rind to match a light beer or bay leaves and peppercorns for a darker brew. The resulting distinguished flavor tastes amazing when paired with no-knead artisan bread. For a sweeter mix that doesn’t require alcohol, replace all the water within a recipe with non-diet root beer. Combine a 2-liter bottle with ½ cup table salt (1 cup kosher salt), a couple chopped cloves of garlic, and a teaspoon of black pepper. Soak for the required time then rinse the meat. Because of the increased sugar in this recipe, it’s perfect for pork or for barbecue-style poultry, pairing well with spice rubs or sauces containing brown sugar and cinnamon, such as a Jamaican Jerk blend. Combine one cup of kosher salt with three quarts water. Add one-quart apple juice, one half cup brown sugar, two tablespoons chopped candied ginger or freshly grated ginger, and one teaspoon allspice berries. Optional: also add up to 20 ounces hard apple cider or apple ale. Soak in the refrigerator for the suggested time. After rinsing the turkey, loosely “stuff” the cavity with one sliced apple, a cinnamon stick, and either a sliced onion or a few cloves of garlic, leaving plenty of space inside the bird for air to safely circulate and cook the entirety of the meat. Find a healthy sweet potato recipe to use as a side dish and pair sweet harvest flavors. Consider pairing your own spices. Chopped hot peppers match citrus for a slight spicy-tangy combination. Rosemary and sage enhance both light and dark beers. Sweeter spices, such as cinnamon and nutmeg, can pair with garlic and black pepper for a Caribbean flavor and apple juice or apple cider vinegar for notes hinting at the New England Countryside. But when you find your perfect combination to a simple turkey brine, document the recipe to repeat later or share with loved ones. Or protect the information so nobody learns the secret to your amazing tender and juicy turkey. 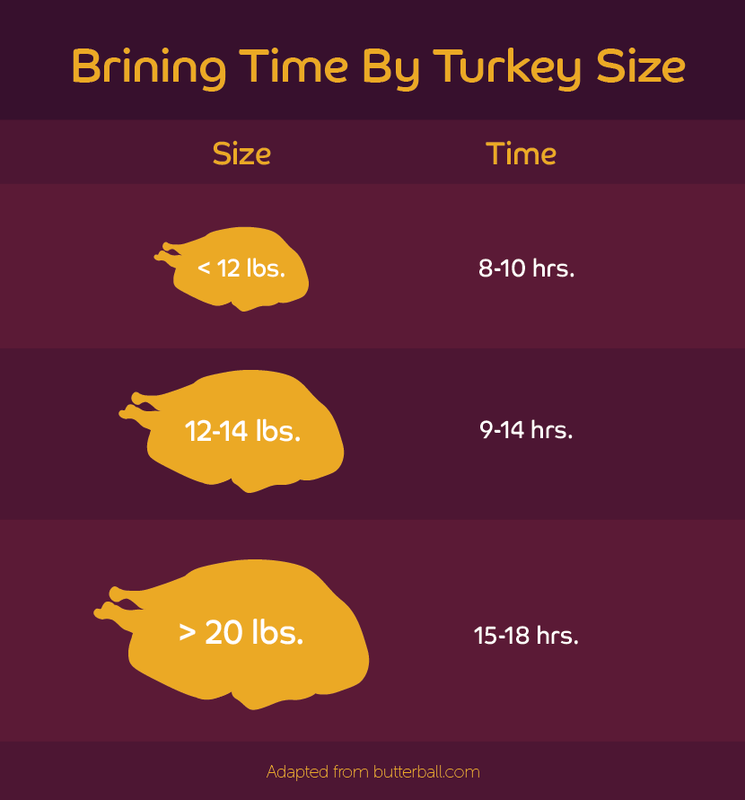 Do you have a turkey brine recipe to share? Post it in the comments below! a, and, apple, apple cider vinegar, barbecue, benefits, best, chicken, cider, cold, cook, countryside, cut, does, England, for, ginger, herbs, heritage, how, in, ingredients, last, long, make, meat, most, no knead artisan bread, of, perfect, plant, pork, poultry, rabbit, recipe, rosemary plant, simple turkey brine, thanksgiving, that, the, to, turkey, turkeys, uses, vinegar, whole.